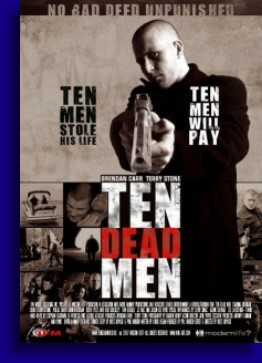 Director Ross Boyasks low budget revenge flick ‘Ten Dead Men’ certainly had style, I’ll give it that. And maybe one of the best straight fight scenes, without the assistance of wires and I’m assuming stuntmen, than I’ve ever seen. The rest of the movie? Hmmm… that requires some further examination. Well apparently murderizing isn’t quite like riding a bike and though the silent Ryan does manage to kill this dude he gets caught in the process angering mightily his former boss Hart (Terry Stone) who was a cousin to the guy Ryan has just offed. As punishment for our anti-heroes transgression, our wayward hitman gets beat senseless amidst a crew of Hart’s most trusted associates and is privy to witness the death of the only thing on the planet earth he gives a damn about before being silenced for good his own damn self. Now I can’t tell you exactly how Ryan managed to survive his predicament considering it looked like to me that these cats did everything in their power, short of vivisection, to kill this dude but here he is. And as you might imagine he is pissed. There are ten people who Ryan has deemed to have played a part in ruining his life and these ten people, in addition to anybody who has the misfortune of getting in his way of these ten people, must die. In particular the rather sick and twisted man calling himself The Project Manager (Keith Eyles), considering he’s the one that has orchestrated much of Ryan’s pain, even more so than Boss Hart himself, and he was the trigger man in ending the life of Ryan’s one true love. The Project Manager for his part seems as intent on stopping Ryan from doing what he has to do as Ryan seems motivated on taking these cats out. Good luck with that Mr. Project Manager. ‘Ten Dead Men’ is obviously a lower budgeted flick as we can tell almost immediately since it looks like it was shot on digital video, and it’s been a long time since I’ve seen a movie shot on digital video and the medium has still yet to mature. But just because ‘Ten Dead Men’ has a grainy washed out look doesn’t make it a bad movie, and in some ways it adds to the flavor a bit. Like I said before the movie certainly is not lacking for style points. Douglas Bradley, he of Pinhead fame, narrates the film throughout and with a voice that is tailor made for Masterpiece Theater his intonations add a definite story telling verve to the proceedings. The Post Production crew put Adobe After Effects or whatever motion graphics program they used to good use with a very clever opening sequence that was used throughout the film to signal the end of any of our ten men who had to die and the films score was well realized too. But the crown jewel of this movie, at least from where I’m standing, was the fight scene between the character of Bruiser played by Tom Gerald and Brendan Carr’s Ryan. Considering Bruiser is portrayed as a professional cage fighter I was curious how they were going to setup Ryan taking this cat out and personally I can’t imagine anybody constructing a better scenario than the way this was executed. Man vs. Man until one dude simply can’t get up no more. It was really a great scene, well shot, violent, brutal, fast moving, no wires and it went on for like half the movie. Maybe not that long but it was lengthy. Great scene. Now ‘Ten Dead Men’ as a movie on the whole, well it has some issues. The film seemed to have some pacing problems since the scenes in between the killing, and some of the kills themselves for that matter were dreadfully slow. It also looked as if it were becoming a chore to work around the fact that they chose to not have Brendan Carr speak throughout the majority of movie since there were times when you were sitting there wondering why doesn’t he just say something. There were a few stabs at humor that probably would’ve better served left on the cutting room floor, with the exception of Ryan’s ghost like ability to avoid massive amounts of bulletry at close range like few 200+ pound men ever, which was bordering on the hilarious. Though the acting in the movie probably wasn’t exactly the Royale Shakespearian Theater, it’s a bloody, testosterone fueled British revenge flick so what we got in that department was more than adequate. ‘Ten Dead Men’ did have its issues as a work of cinematic art to be sure, but the positives tip out the negatives from my vantage point and made this quite the stylish exercise in violence and brutality and has the makers of this movie brimming with that always dangerous word… potential. Let’s see if they can exploit it.